In 1978, two girls were coaxed into a car while strolling to school in the sleepy village of Bampton in the Peak District. One is later found; the other never is. More than thirty five years later, an elderly woman is discovered dead in a hotel room - the mother of the still-missing girl. Her apparent suicide stirs up a past that many in the village would rather forget, and kick-starts Sarah Ward's absorbing and elegantly written debut mystery. There is a lot to like about this novel, which creeps up on you in its storytelling. Ward does a terrific job evoking the environment and daily life of the ruggedly beautiful Peak District, as well as creating a beguiling cast of characters who manage to seem fresh even if on the surface they conform to classic crime fiction tropes. DC Connie Childs is an ambitious young cop on the rise, itching for action and advancement in a quieter corner of Britain. DI Frank Sadler is her more reserved superior. Superintendent Llewellyn was a fresh-faced constable on the 1978 kidnapping case, and is troubled by Yvonne Jenkins' suicide. He asks Sadler and his team to take another look at the original crime, to see if modern police methods can help shed new light on the oh-so-cold case. The spirited Childs is pleased for the chance to shine while her colleague-rival junior detective is distracted by the stresses of his upcoming nuptials. Meanwhile, Rachel Jones finds her own past brought painfully back to light: she was the girl that was found. It's an incident that's affected her in a myriad of ways ever since, even though she claims to have no memory of the events. She recovered from the kidnapping thanks to her strong-willed mother and grandmother, and is now a genealogist who specialises in the matriarchal lines of family histories. While Rachel fears the media frenzy once the press links the suicide to the old tragedy, when one of her former teachers is strangled a few days later, she realises that Pandora's Box has been opened, dark secrets are seeping out, and she'll have to take steps to protect herself while trying to work out what really happened. Jones and Childs/Sadler investigate the past and present in separate and inter-linked ways, building to a thrilling conclusion as the disturbing truth is uncovered, and the guilty parties are backed into a corner. This is a very female centric mystery novel. Two girls are kidnapped, by a woman. The case is resurrected due to the suicide of one woman, then the murder of another. The two main leads are female: a policewoman battling for her place in a still male-dominated world, and a middle-aged history-buff who was raised by a woman with a deep suspicion of men, and now researches and shares the forgotten stories of women in her genealogy clients' family histories. But as a male crime fiction reader, I really liked it. Ward does a great job of evoking many issues faced by woman, historic and contemporary, without painting the male characters as caricatures (which I've seen in other such novels) or paper-thin pieces just there to play antagonist or make a political or social point. The rivalry and collegiality between Childs and her fellow DC feels authentic and multi-layered. The relationships between Childs and Sadler and Llewellyn, or Jones and other characters, likewise feel very real. Ward inserts little touches and complexities that mirror real-life into all the working, personal, and other relationships, giving them a fuller feel. 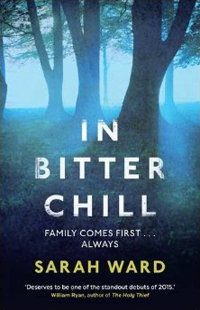 A strong theme of family history, and questions about how best to deal with troubling situations from the past, runs throughout IN BITTER CHILL. Thematically, Ward nicely balances provoking questions in the readers' mind while not getting up on a soapbox or delivering clear-cut answers. Accordingly many of those issues and questions enjoyably linger after the storyline itself is wrapped up in the final pages. Overall, I was very impressed with this first effort from Sarah Ward. IN BITTER CHILL is like a modern take on the classic British village mystery, evoking those Golden Age trends of puzzling plots in picturesque countryside settings, delving into dark issues and secrets without being gritty or graphically violent. I look forward to more from DC Childs, DI Sadler, and this talented author.